Some people are super serious about the whole steampunk thing, making their own elaborate costumes and props that rival anything your would see in a Hollywood production. 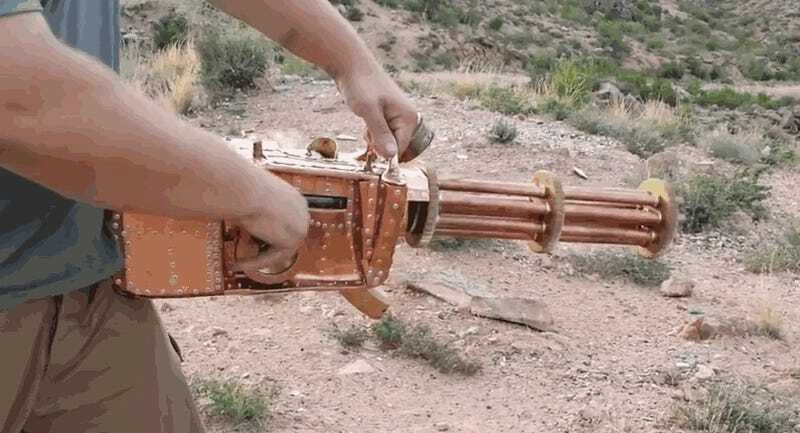 But one guy built himself a functioning, real-deal, steampunk gatling gun a couple of years back, and the video can still put other fanatics to shame. This improvised gatling gun is built around the guts of the tried and true Ruger 10-22, this thing whips out .22 Long Rifle rounds at the spin of a crank. Make no mistake—the .22LR cartridge may be small, but it can be very deadly (especially when a swarm of them pepper a target at once). All it takes is a hit in a highly critical area to bring down even medium-sized game or humans. It would be interesting to see this thing operate flat out with a drum magazine attached.